Creating an awesome submission can earn you a place in the most popular links on the front page, badges, featured author status, and maybe even prizes! Plus you want to put your best paw forward and be as corgilicious as possible! Here are some tips and tools for making each of the different types of submissions: corgi photos, corgi memes, corgi comics, corgi news, and corgi articles. Ideally, use your own photos. If submitting photos you found on the web, make sure that you have permission to submit them or that they are truly public domain or creative commons items. Flickr creative commons has a ton of great corgi photos if you want some to use for comics or memes. 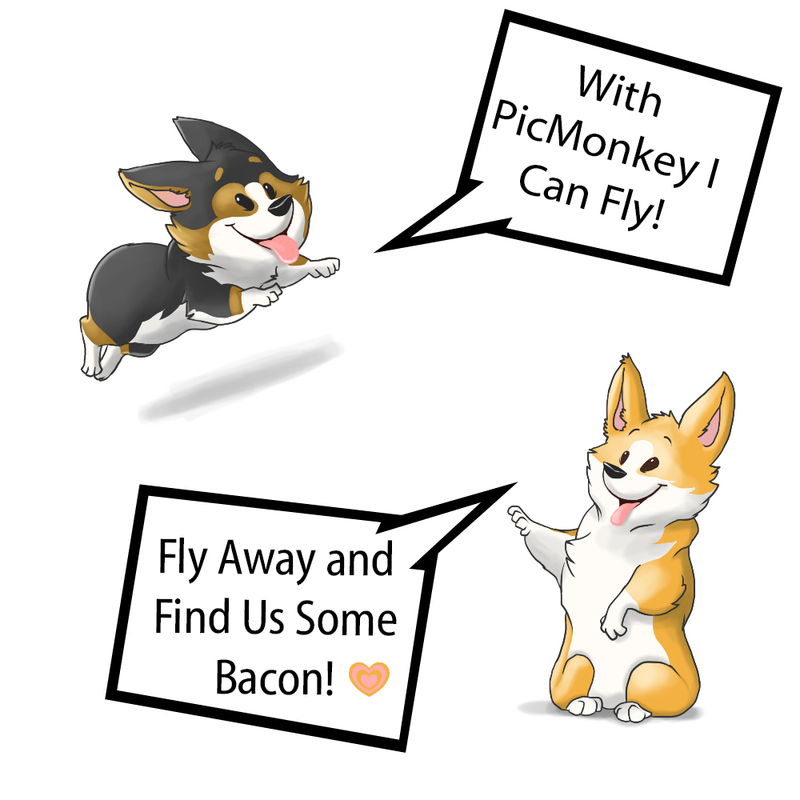 Here is a link to a Flickr corgi search for creative commons photos that allow your to modify, adapt, or build upon the work. Please be sure to include a photo attribution link with your submission. We also give you permission to use any photos found on Puppy on a Roomba. If a copyright problem arises, we will remove any items upon request of the original owner. Our favorite tool for doing cool things with photos is PicMonkey. It is also free! Although they do have a very affordable premium version that adds some additional cool stuff. PicMonkey allows you to do things like edit photos, add text, graphics, comic bubbles and frames, and make collages. It is super easy to use. We suggest that you simply go play around with it to learn it. The best photos are clear and of decent size. We ask that all photos be at least 600 pixels wide and we prefer them to be between 700 and 750 wide (the image below is set at 750). It is best to keep them under 800 wide or so. If you need to resize a photo, you can do that in PicMonkey. Save your photos there in the large (sean) file size. Smaller settings sometimes make the images blurry. If you just want to show off your cute corgi, you need do nothing more than submit a photo. But photos are even more fun when made into comics and memes! PicMonkey provides a free super easy way to add text to your photos. To make a meme, upload a photo to edit on there and simply add your text. You can also add fun banners and graphics if you like. Be creative! Put funny slogans or quotes on photos and watch them get shared! We also have a meme generator here on the site, but it is rather buggy (we tried feeding it bacon, but it still doesn’t seem to like us very much). To assure being featured on the main corgi comics page, you are probably better off making your own custom meme. There are a couple of ways to do corgi comics. (1) Individual Photos. You can make each frame of your comic its own photo. PicMonkey will let you add comic bubbles and text. (2) One Long Photo: We use Picmonkey to do this and it can be done in a couple of ways. One way is create a collage and use the “ducks in a row” option to put individual photos in frames. Rotate the whole thing lengthwise. Zoom in to see what you are doing better. The other way is to use the design function and set your desired dimensions. We often use 800×3200 for 4 frames. Then go to overlays and use the “your own” button to pull in your photos. This way is more difficult, but it also gives you more control over the size and placement of panels. Corgi News items are short posts or articles about items of interest to Corgi Nation. For example, if you are holding an auction to help a sick pet, you might post about it here. Or perhaps you want to announce your new etsy store. Maybe you just have a short fun item to share that does not fit the other categories. A good corgi news post will be of interest to corgi lovers and provide useful information. Please don’t spam of oversell. Think about the kinds of things you would like to see as a reader of the site. Also please note that we do not allow posts advertising he sale of puppies, nor do we allow commercial posts from large brands. Something about your personal etsy or cafepress store is fine, but if you own a commercial pet store or something along those lines, please contact us about advertising. We also reserve the right to remove notices of fundraisers if the validity of them comes into question. Articles are longer posts about an informative or fun topic. This could be coverage of the local corgi picnic with lots of photos. Or perhaps you would like to write an informative article about a corgi health topic or review a product. Fun short stories and poems are welcome too! Really anything that is longer than a couple of short paragraphs is considered an article. Consider writing your article offline and then copying it into the form. That way you won’t lose your work! You may also contact us about an author account if you would like to submit lengthy, in-depth items. Those who earn featured author status may also have that option. Author accounts gain the ability to use full editing tools and can save their work and come back to work on it more later. Successful articles are spell checked and in good grammatical form. Our corgilicious editors will also look things over an fix any glaring issues before publishing. We want to help you put your most fraptastic foot (or paw) forward! We will share your submission to our social media accounts. Do us a favor and share it to your accounts as well. Also visit a few other submissions and comment on them or share them if you like them. Try our star rating system to help identify the best content on the site. Help your fellow authors get recognized! Thanks!